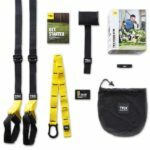 Many people may know suspension training straps as a TRX suspension trainer but TRX is the actual brand name of the suspension trainer. A suspension trainer allows you to do 100’s of exercises using just your own bodyweight, this in turn helps you improve your strength, balance, flexibility and core. Suspension trainers can be hooked onto a wall mount, door or to a vertical anchor point, making it very portable as it can be used in most places. 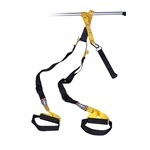 Anyone can benefit from using a TRX home suspension training kit as it’s suitable for people of all fitness levels. 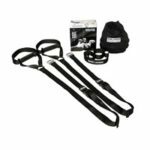 Plenty of exercises – There are literally 100’s of exercises you can do with a pair of suspension training straps. There are enough workouts that can target every muscle group, check out this useful list of suspension training exercises which will show you some of the best exercises and also instructs you how to do the exercise and what muscles are targeted. Strength – Suspension training is an effective form of resistance training, as you’re training with your own bodyweight, you can increase the number of repetitions if you have a good strength to weight ratio so anyone can benefit from suspension training. Balance – Most exercises performed on the TRX suspension trainer requires an element of balance some more than others. If more balance is required this will increase the difficulty of the exercise but in turn will increase your strength and ability to balance. Flexibility – Bodyweight exercises tend to have a wider range of motion and unlike a weight machine you’re not restricted to how much you can move. Exercising with movements performed at full range are likely to increase your flexibility. Core – Most of the exercises require some core strength especially the exercises which requires balance, as a lot of the times you have to use your core muscles to stabilise yourself. Portability – A suspension trainer doesn’t take up much room and it can be folded up and taken with you pretty much anywhere. Our top 5 best suspension trainers all come with a carry bag. 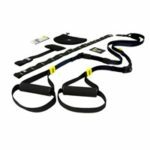 Price – If you decide to buy the original TRX home suspension training kit then this would cost you more money because you’re also paying for the brand name. 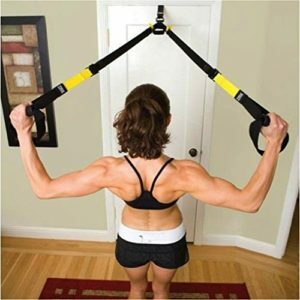 The other suspension trainers are also very good and will do the same job the TRX brand would, but it’ll only cost you a fraction of the price!